make it perfect: .Cushions in August Fields. 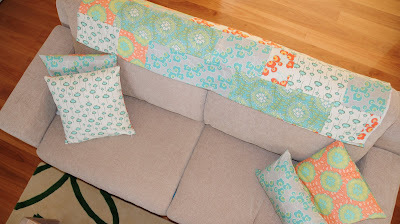 Finally getting around to stealing photos of Carli's blog to show the cushions and quilt I made for her new couch in her new house. Zippers and all! I don't know why zippers have intimidated me in the past...they weren't hard at all though. 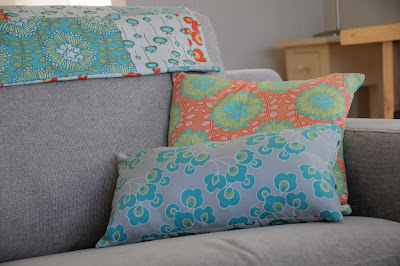 We decided to go with a single print either side so the cushions could be reversible. I was very impressed with the fabric Carli choose. Bright and fresh, but not too overpowering. I'm very jealous though that her cushions were finished in just a few hours and are already adorning her couch whilst mine are still a work in progress. I'm really starting to regret my decision to HAND-QUILT every cushion, front and back so that the fabric is a bit stronger...it is taking me FOREVER! After not having much experience using home decorator weight fabric before, this project has won me over. It is not too thick, not too thin...holds it's shape really well and makes for a lovely, heavy feeling quilt. For more cushion and quilt pics see Carli's post here. Where is the fabric from? I LOVE it! they look realy good, well done. Ooooh they are fabulous! Yeah, where is the fabric from? 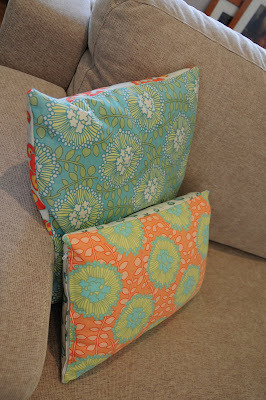 I want gorgeous cushions for my couch!